The injured airport officer is expected to fully recover. The director of the Bishop International Airport in Flint, Michigan, believes a maintenance worker saved the life of the airport police officer who was stabbed in the neck during an attack Wednesday that is being investigated as an act of terrorism. The maintenance worker, who was not identified, jumped in and helped restrain the attacker, who allegedly assaulted airport police officer Lt. Jeff Neville outside the airport's TSA screening area Wednesday morning, Lt. Dan Owen of the airport Fire Department said today. Then Owen and the airport's Director of Public Safety, Christopher Miller, who had heard the commotion and were about 15 feet away, arrived at the scene within 4 or 5 seconds and helped restraint the suspect, Owen said. Officials said Wednesday Neville was able to stop the assault within a minute and "never stopped fighting" until the attacker was in handcuffs. The suspect, Amor Ftouhi of Canada, is in custody and Neville was listed in stable condition Wednesday and is expected to fully recover. Airport Director Craig Williams said today of the maintenance worker, “I believe he saved Jeff’s life." "I’m proud of all of our responders," Williams said, adding, "I’m especially proud of him because he jumped out there and did something that is courageous. I’d like to say we’d all do the same thing, but I can’t even say that I would. I can’t thank him enough. I’ve already thanked him a lot. I’m just really proud that he’s part of this team." After Ftouhi was taken into custody and interviewed by authorities, officials said it appears the suspect "has a hatred for the United States and a variety of other things that motivated him ... to conduct this act of violence." During the attack, Ftouhi, armed with a roughly 12-inch knife that had an 8-inch serrated blade, allegedly yelled "Allahu Akbar," David Gelios of the FBI said. Gelios said the attacker "continued to exclaim 'Allah' and he made a statement to the effect of 'you killed people in Syria, Iraq and Afghanistan' and 'We're all going to die.'" 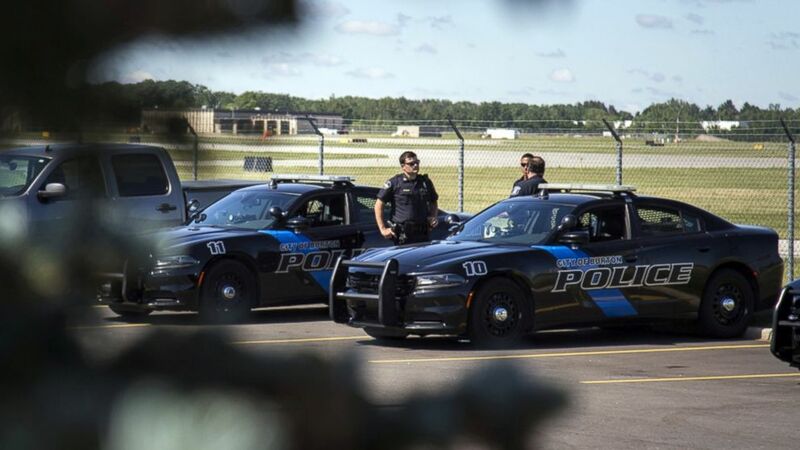 (Shannon Millard/The Flint Journal-MLive.com via AP) Burton Police Officers gather at Bishop International Airport, June 21, 2017, in Flint, Mich. Officials evacuated the airport Wednesday, where a witness said he saw an officer bleeding from his neck and a knife nearby on the ground. No one else appears to have been involved and there is no information to suggest a wider plot, officials said. 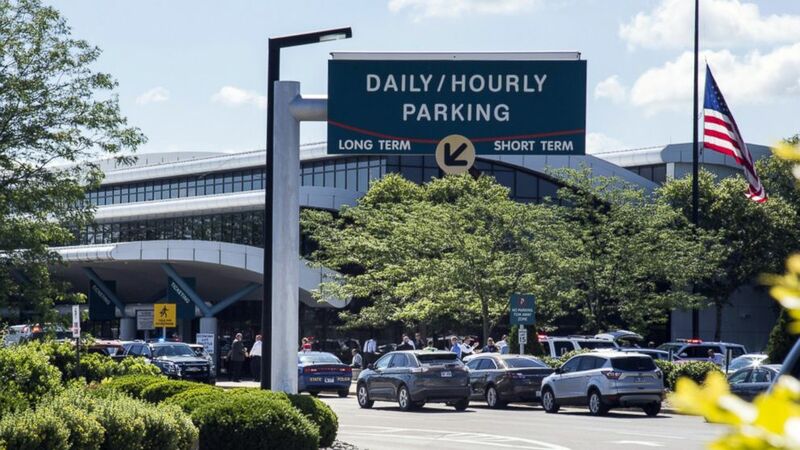 A complaint was filed against Ftouhi Wednesday for "violence at an international airport," but officials noted that there could be more charges in the future. The ongoing investigation is part of a joint operation with Canada, officials said. Ftouhi legally entered the U.S. in Lake Champlain, New York, on June 16, and later traveled to Flint, Gelios said. The airport, which was evacuated and shut down Wednesday, later reopened. All passengers were safe, officials said. Williams said today that Neville is doing well and recuperating at a hospital. Neville has been an employee since 2001, Williams said, and is "well loved by everybody here just for his personality, his professionalism. He treats everybody with respect."